Thomas Dennis Jackson was born in 1835. 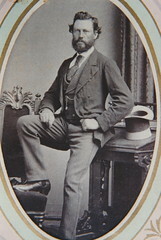 On November 5, 1849, he arrived in Adelaide with his father and mother, William Jackson and Jane Jackson (née Philipson) and six siblings on Navarino. The family made their home on Jackson Hill Road near Willunga, calling their property "The Grange". In his mid- to late-twenties, Thomas had some success with slate carving. He won two prizes at the Society of Arts (Adelaide) exhibition, which contrasts with the practice of other Willunga slate carvers, i.e. Hawken and Richards who displayed work at the Willunga Show. One item can be seen at 3Monkeys Fine Foods in Willunga. The painted slate fireplace has a centrepiece carved by Thomas Dennis Jackson. Thomas Dennis Jackson married Alice Lewsey on June 30, 1873. In 1874, land he owned close to Willunga was badly scorched by bush fire. While in this part of the district I went a bit out of my course to have a look at a rather primitive but serviceable-looking Chilian mill, designed and constructed by Mr. Jackson, one of the pioneers of the district, for the Winnininnie Prospecting Association, the property of which he is at present managing. SA Chronicle 28 Jan 1888. Unfortunately, he contracted fever and died on 15 July 1888 at the age of 53. After his death, Alice returned to Willunga. Do you remember Jackson, Thomas Dennis ? Then Join up and add your memory here.